Apple's market share has received a boost from the iPhone 5s and iPhone 5c but has not seen the same uplift as when the iPhone 5 was released, according to sales data from Kantar Worldpanel ComTech for the three months to October 2013. 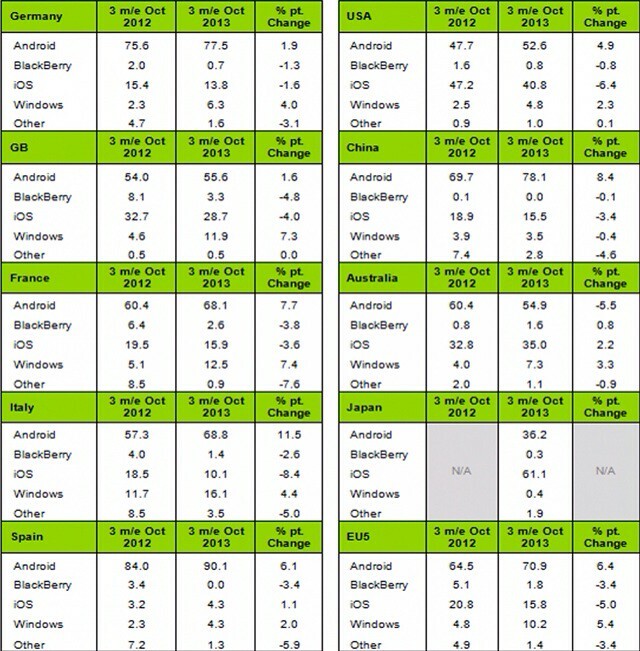 Kantar notes that across the major European markets, Android remains number one with 70.9% share. Apple holds 15.8% share and Windows continues to see rapid growth, now accounting for 10.2% share. Dominic Sunnebo, strategic insight director at Kantar Worldpanel ComTech, comments: "In almost all markets, the iPhone 5S and 5C releases have given iOS a significant bounce compared to the previous month. Generally, Apple’s share of the market still remains lower than when the iPhone 5 was released, although this is not wholly unexpected as shoppers tend to react more positively to ‘full’ releases than incremental improvements such as the 5S and 5C." Notably, the iPhone 5c appears to be attracting new customers to the brand. While Windows' market share is continuing to grow reaching close to 5% in the U.S., its growth remains on low end smartphones like the Lumia 520 and 620. The OS is also having trouble in the Chinese market where its market share is only 3.5%.